Every once in a while, talk around the campfire turns away from strategies for riding herd and so forth to mythology. Some cowboys feel that they've talked wendigo or other scary native legends out, so they move on to myths of history. One that gets brought up every once in a while is the story of Great Britain. Amazingly, a few cowpokes actually believe it existed. Some self-styled intellectuals speculate that England (a part of the British Isles) exists in a parallel universe. The story goes that the British Isles (a few big ones and about six thousand smaller islands) were a popular place for commerce and some amount of science. Sadly, the Brits rejected the true God and indulged in paganism, especially evolutionism. Their paganism, surrender to Moslem influences, atheism, and unjustified intellectual arrogance led to the utter destruction of Britain. Yep, the whole shootin' match sank beneath the waves of the Atlantic, never to be seen again. Some people have written extensive histories of the formerly Great Britain, but many such scribblings can be found throughout literature — especially fantasies, such as Lord of the Rings and others. People have even brought up the fact that Britain is shown on maps of antiquity. Don't pay those no nevermind, since mythological Atlantis is also drawn onto maps such as this one from about 1669. 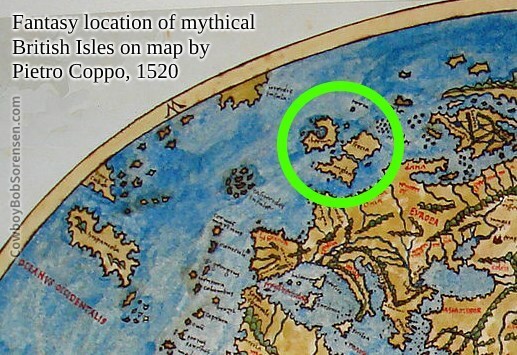 Another nice detail to fill out the fictional history of Britain is the idea of Doggerland, which supposedly connected the mythical islands with the rest of Europe. To make the story more interesting, Doggerland was also submerged. Seriously, that is an excellent literary touch. Unfortunately, conspiracy theorists perpetuate the myth that Britain not only existed, but it was great as well. Some even go as far as to try and convince others that it still exists today. They may claim, "Some people of the Isles were called Celts, and I have Celtic ancestry. I had DNA testing done. I'm also a descendant of the Canaanites." Whatever helps you sleep at night, Beauregard. Like other myths that seem to have a basis in history, archaeology, paleontology, archaeology, and so forth, the formerly Great Britain remains shrouded in mystery and mythology. It has been said that parts of Britain, both geological and archaeological, have been found washed up on the New Jersey shore. These have been discredited. Like evolutionism, if something has a veneer of truth and funding for scientific research, gullible people are likely to believe it.